It’s all very well driving the Fiesta dual-clutch automatic in everyday traffic. It was also great fun driving the car on the twisty roads of Goa a few months ago. But driving the car on a Formula 1 track is a completely different experience. Wait a minute. An automatic car on a Formula 1 track? Well, that’s just what we did at a track day organized by Ford to sample the handling of the Fiesta Powershift on the track. It is a brave move by the company to actually go out and ask people to drive an automatic on the track. But a few minutes into our first lap and we could see how it made sense. Now the Ford Fiesta automatic, like we’ve told you in our earlier review and video on the car, is powered by a dual-clutch, six-speed automatic transmission. It features a D-mode, which is your regular drive mode with upshifts and downshifts on the transmission happen at the optimum rpm to keep the car moving smoothly. Read more about the Global Ford Fiesta and its variants here. The shifts are much faster than a conventional automatic and also because it features electrically operated twin clutches, you don’t lose momentum. And that’s good for mileage as Ford claims the Fiesta Powershift gives 16.97 kmpl, which is even more than its manual counterpart. But once you’re on a track like the Buddh International Circuit, it really isn’t much fun driving in D-mode. For the track you need to slot it into the last slot on the selector – the L-mode. What this mode does is to hold the car at maximum rpm in each gear and if you drop to below 3,500 rpm, it downshifts a gear automatically allowing you to constantly drive at high rpm, and consequently high speed. We would go so far as to say, it is almost as much fun as a manual, with the added benefit of having both your hands on the wheel at all times. We do not normally give out top-speed figures on cars, because on public roads you really can’t do those speeds. 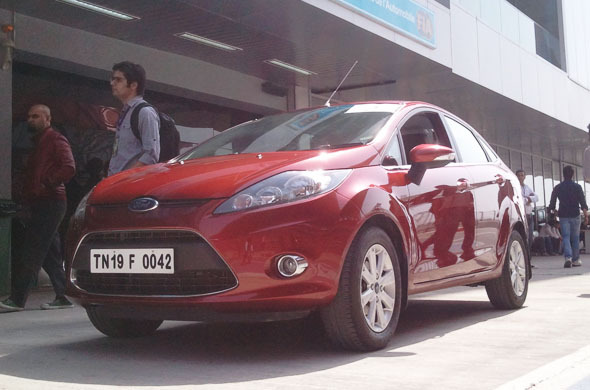 But on the Buddh International Circuit, the Ford Fiesta Powershift got up to an indicated 165 kmph on the back straight. And then there are the tight turns on the circuit, which we confidently managed to take at three digit speeds. Of course, that kind of driving is torture on the tyres, but even though the tyres were screeching for mercy, the car held its line perfectly, which says something about the handling of the Fiesta. It has an electrically-assisted power steering with pull-drift compensation – which means it holds a straight line even if the road is banked. And this steering inspires confidence in turns. Also see our Ford Fiesta Classic Video review! On a couple of the corners, especially turns 4 and 15 on the circuit, we did experience plenty of understeer, bordering on a front-wheel skid, but that’s to be expected from any front-wheel drive car that’s pushed to its limit. Body roll can also be experienced to an extent, but the suspension handled the cornering forces well. Ford had also created a small ramp to test the hill-descent assist and hill-hold functions of the Fiesta – but we found that easier to experience on our earlier test drive. After three fun-filled laps of the circuit, we are happy to report that the Fiesta Powershift fared very well on the track. If you are an enthusiastic driver, you will love the way this car handles at high speeds, especially if you do drive on an Expressway or two in your regular scheme of things. For more on the Fiesta Powershift automatic, watch our video review. « Chevrolet Cruze facelift to take cues from the Cruze Station Wagon!